The Haggis Horns were the warm up act for Sharon Jones and the Dap Kings in The Ritz in Manchester on Thursday night. The crowd was just settling down when this great band of merry men strolled on stage and rocked out on every instrument imaginable, getting everybody up for the evening ahead. Consiting of 8 fellas they made a right clamour playing everything from saxaphone, guitar, trumpet, drums, bongos, percussion drums, the keyboard, tamberine, triangle and the flute. Their music style was uplifting and with little vocal intrusion you could really immerse yourself in the complex rhythms they created. They had a sound that warmed up the crowd nicely and set the atmosphere perfectly for the main act to follow. 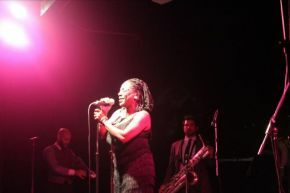 Sharon Jones and The Dap Kings have been on tour since April 6th 2010 and have only two more dates left of their tour, next up is Scotland and then they end it all in Ireland. The Dap Kings were the fist to enter the now fully crowded venue, enticing the audience with the arrival of Sharon Jones whom had a top 15 in the Billboard charts recently, and she was insantly recognisable when she walked out. Sharon Jones has a fantastic stage presence and has that real old school soul diva vibe about her, reminiscent of Dinah Washington and Aretha Franklin with those big bands behind them. Dressed in a Tina Turner style tassle dress she really knew how to work it and her voice was immaculate. She was very warm and down to earth with her fans and at one point she actually picked a guy from the crowd to climb over the barrier and jump on stage so that she could show him her dance moves. One of these she named 'the boogaloo' and then she even broke into a funky 'chicken dance' at one point which was very entertaining. Overall the night was a masterclass in soul and Sharon Jones put on an excellent show in Manchester.